Welcome to the newest post in the 25 Days of Giving series. Have questions or a topic related to charitable giving you want covered as a part of the series? Contact us! You want your favorite charity to be wildly successful. Whether you’re working for the nonprofit as staff, serving on the board of directors, or assisting as a donor or volunteer, you want your nonprofit to have every chance to reach its goals and objectives. The Internal Revenue Service (IRS) strongly encourages nonprofits to adopt specific governance policies to limit potential abuse, protect against vulnerabilities, and prevent activities that would go beyond permitted nonprofit activities. The IRS also audits nonprofits, just as it audits companies and individuals, and having these policies in place can only help you should you be audited. 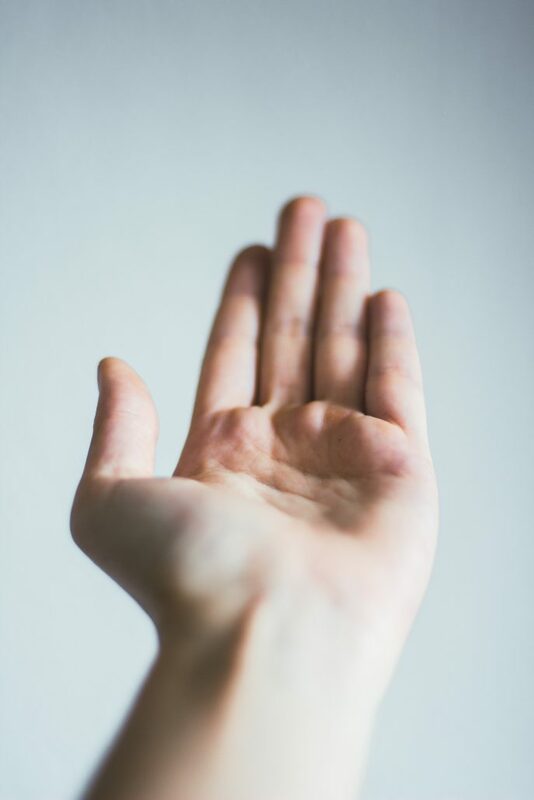 Finally, and perhaps most importantly, having solid policies and procedures in place will provide foundation for soliciting, accepting, and facilitating charitable donations. Each nonprofit is unique, and accordingly policies and procedures needed will vary for each. For instance, a non-operating private foundation will likely need a different set of documents than a public charity. However, most nonprofits will want, at the very least, to consider having the following policies in place. Articles of incorporation are necessary to even form a nonprofit corporation; the document is filed with the state and accompanied by a filing fee. This policy can be known by other monikers as “certificate of incorporation,” “articles of organization,” or “charter document.” Think of this as the constitution of the organization. While it can be fairly short, there are some necessary elements in the articles that are required for federal tax-exempt status. Those elements include a statement of purpose, legal address, emphasis on not-for-profit activities, duration, names and address of director(s), and a dissolution clause, among others. You may want to check out the IRS’ sample charter. Nonprofit board members are generally tasked with two major responsibilities of support and governance. A board’s rules and responsibilities document should outline the requirements and responsibilities of board members. Some examples of basic components include fundraising participation, determining the organization’s mission and direction, selecting and regularly evaluating the nonprofit director/CEO, and protection of public interest. A policy regarding board roles and responsibilities should encourage nothing short of ethical and legal integrity within board members. 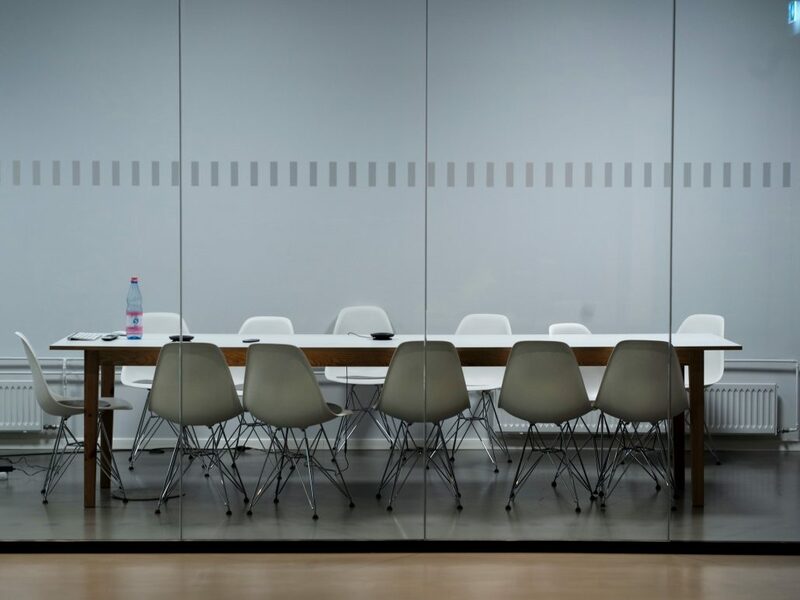 If you’ve ever been part of any board or committee, you’ve definitely heard reference to the bylaws and received a copy upon joining the organization. Nonprofit bylaws serve as the internal operating methods and rules that specify things like the election process of directors, employee roles within the nonprofit, and operational manners of meetings. Specific language in the bylaws is not required by federal tax law, but some states may require nonprofits to have written bylaws to be considered tax exempt. This document can most often be used to resolve uncertainty between board members and takes the guesswork out of operations. Just as it sounds, a code of ethics document puts in place a set of guiding principles for behavior, decisions making, and activities of those involved in the nonprofit, including board members, employees, and volunteers. While principles innate to your organization such as honesty, equity, integrity, and transparency may be understood by all involved, this formal adoption allows those involved to make a formal commitment to ethical actions and decisions. Sometimes this document is known as a “statement of values,” or “code of conduct.” Many organizations post their code on their website to demonstrate accountability and transparency. Competitive compensation is just as important for employees of nonprofits as it is for for-profit employees. Having a set policy in place that objectively establishes salary ranges for positions, updated job descriptions, relevant salary administration, and performance management is used to establish equality and equity in compensation practices. A statement of compensation philosophy and strategy which explains to current and potential employees and board members how compensation supports the organization’s mission can be included in the compensation policy. exclude individual board members from voting on matters in which there is a conflict. Note the IRS Form 990 asks whether the nonprofit has such a policy as well as how the organization manages and determines board members who have a conflict of interest. This policy is all too important as conflicts of interest that are not successfully and ethically managed can result in “intermediate sanctions” against both the organization and the individual with the conflicts. A document retention policy doesn’t mean that EVERY piece of paper and digital report should be kept for a specific duration. But, consider if a document is unknowingly tossed by a nonprofit employee and is later needed in a legal matter. That can cause irrevocable damage. So, ensure all board members, staffers, and volunteers are trained and have a copy of the document retention policy, which should clarify what types of documents should be retained, how they should be filed, and for what duration. This policy should also outline proper deletion/destruction techniques. An employee handbook is another one of the more common nonprofit documents. A quality handbook should clearly communicate employment policies and enforce at-will provisions to all employees. Employment laws are complicated and complex. An employee handbook written/reviewed by a licensed attorney is a good legal step toward avoiding employment disputes. (Yes, just as you need a lawyer to write your estate plan, you’ll need a lawyer to craft/review your employee handbook.) Review your employee handbook regularly, as an out-of-date or poorly written handbook can leave the organization open to employment ambiguity and conflicts. When is an employee handbook not an employee handbook? This document specifically addresses guidelines for making financial decisions, reporting financial status of the organization, managing funds, and developing financial goals. The financial management policies and procedures should also outline the budgeting process, investments reporting, what accounts may be maintained by the nonprofit, and when scheduled auditing will take place. Gift acceptance is yet another policy the IRS considers to be a best practice for any tax-exempt nonprofit, and the gift acceptance policy can help set acceptance policies for both donors and the board/staffers. There is no federal legal requirement, but this policy does allow you to check “Yes” on Form 990. If well-written and applied across the organization, the policy can help the organization to kindly reject a non-cash gift that can carry extraneous liabilities and obligations the organization is not readily able to manage. One way a Board of Directors can fulfill their fiduciary responsibility to the organization is through investing assets to further the nonprofit’s goals. But, before investment vehicles are invested in, the organization should have an investment policy in place to define who is accountable for the investment decisions. The policy should also offer guidance on activities of growing/protecting the investments, earning interest, and maintaining access to cash if necessary. Many organizations hire a professional financial advisor or investment manager to implement investments and offer advice. This person’s role can be accounted for in the investment policy. While these documents may sound like a lot of work, the time and energy you place into ensuring your nonprofit is set up for success will pay off in the long run by saving you legal and IRS fees, internal conflict, violations, and compliance issues. Plus, you can enlist a qualified nonprofit attorney to do the leg work for you! You may say, “My organization already has a great set of policies in place!” Which is great. But, you should continuously update them as needed/wanted. A policy from 2002 may have been perfect at the time, but could be in dire need of updates. I’d advise making policies the main subject of a board meeting to review what policies have been adopted, which policies need revisions, and which policies you’re missing altogether. If you’re not sure where to start, or how policies should be drafted, read, or enacted, I would be happy to offer you a free one-hour consultation. You can also take me up on my 10 for 990 policy special. I’m here to assist in drafting or revising your set of nonprofit policies, so don’t hesitate to contact me via email or phone (515-371-6077). We’ll schedule your free one-hour consultation and make a plan to set your organization up for success! When forming a new nonprofit there are really two must-have documents you need to get the dream off the ground. Those two documents are articles of incorporation and bylaws. Of course, there are other important documents you will need, but it’s good to tackle first things first! Recently on the blog we explored the state and federal requirements and best practices for articles of incorporation. Now, let’s learn about bylaws! serve as the internal operating rules of a nonprofit. specify processes like the election process of directors and operation of meetings. resolve any uncertainty between board members on issues of correct process. Do Bylaws Need to be Filed or Adopted? Unlike articles of incorporation, bylaws are not filed with any government entity like the Iowa Secretary of State. However, Iowa law does require that the initial bylaws of a nonprofit be adopted by its board of directors. Another essential element that can be mistakenly forgotten is a paragraph for amending the bylaws in the future. Times change and the circumstances of how your organization can do the most good can shift. In such a case your board will want to rely on the procedure for amendments outlined in the bylaws to reflect the transition. Again, an organization’s bylaws are like an internal roadmap if there’s any question of structure or procedure. As fiduciaries of the organization, board members should re-read the bylaws at least annually for sustainable good governance. Of course, brand new board members should be provided with a copy as a part of their board orientation. What About All the Other Documents I Need? For IRS charitable exemption status you’ll need to file Form 1023. During operation, you may also need to annually file some version of Form 990. Plus, I highly recommend all nonprofits have at least these 10 important policies in procedure documents! Form 990 Variations: Which Annual Return Should Your Nonprofit File? There is much more to be said on bylaws as they can and should be tailored to your individual organization. It’s a wise investment to enlist a professional (like an attorney well-versed in nonprofit law!) to draft quality, comprehensive bylaws personalized for your nonprofit’s needs, mission, and goals. Questions? Want to learn more about turning your dream of an organization that makes a significant impact or positive change? Grab my complimentary Nonprofit Formation Guide and then contact GFLF for a free consult! Recently I had the pleasure of presenting on the legal and financial duties of nonprofit boards at the Iowa Museum Association. One of my main core services is nonprofit formation and compliance, and a nonprofit’s board of directors (or supervisors, depending on what they’re called) is essential to both of those categories. When submitting a 501(c)(3) application (or a different type of tax exempt application), the IRS almost always requires at least three distinct individuals be listed on the board of directors. In terms of compliance, the nonprofit board is the governing body of the organization and therefore has distinct duties and obligations to the corporation. 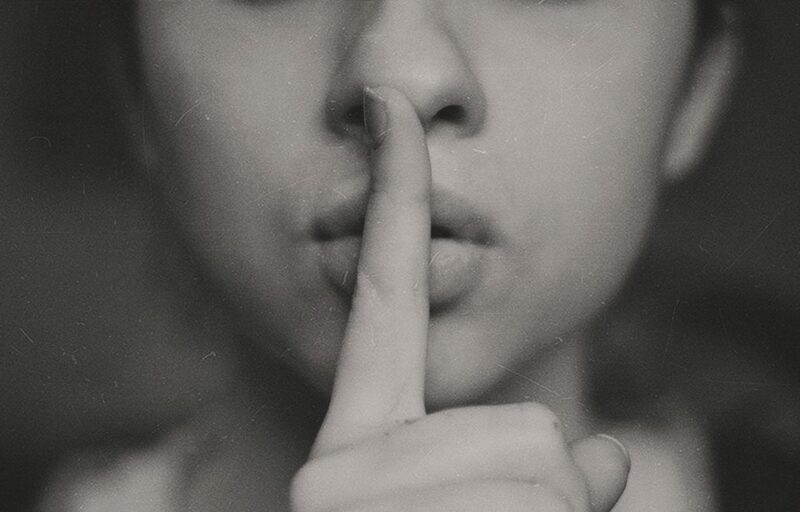 Whether just starting out or continuing a long-standing tradition of operational excellence, it’s essential your nonprofit’s board know their responsibilities, understand their fiduciary role, and implement best practices. This goes for the board of directors as a collective body, as well as each of the individual directors. Each nonprofit organization is unique and consequently, each nonprofit benefits from individualized counsel on how to maximize board operations. But, there are general guidelines of good advice that apply across the board. (Ha! Get it?) 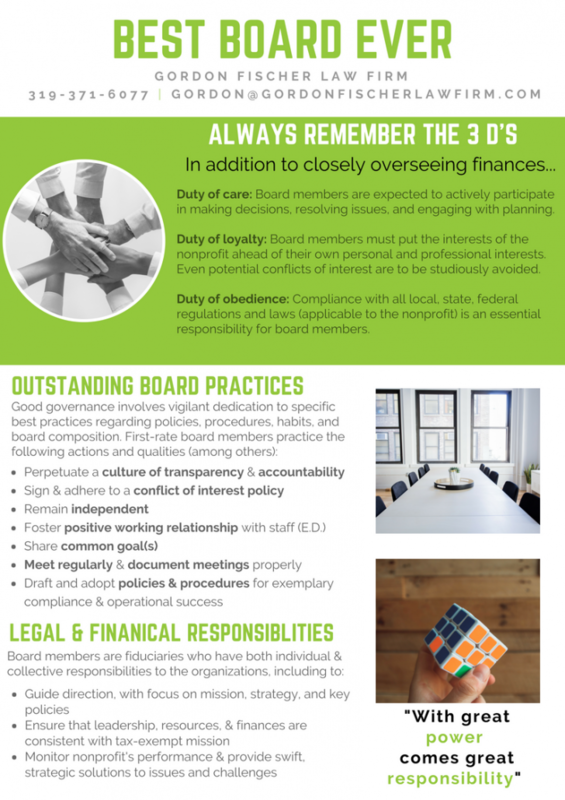 To that point, I’ve created a resource explaining board duties, best practices, and legal and financial responsibilities that most all nonprofits will find useful. If you’re a nonprofit leader (such as an executive director) you could even print this out and include it in board orientation materials and board handbook. Download your copy of the “Best Board Ever” guide here! Questions? Thoughts? Need a speaker to present on a topic related to nonprofit formation and guidance or employment law? Don’t hesitate to contact Gordon via email at gordon@gordonfischerlawfirm.com or by phone at 515-371-6077. In wise words attributed to Voltaire (and the Spider-Man comic book), “With great power, comes great responsibility.” Never have these words been more true than when it comes to serving on a nonprofit’s board of directors. 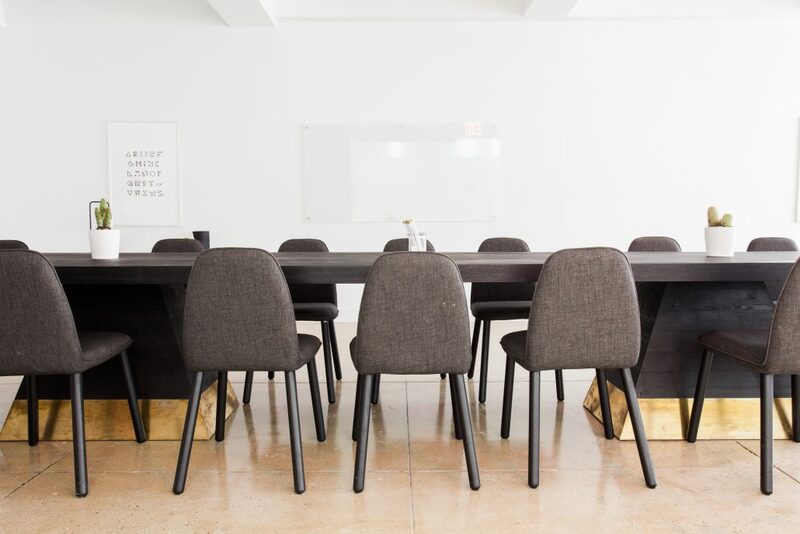 Being asked or elected to serve on a board can be a huge honor, but it also comes with great legal and fiscal responsibilities. Duty of care: This means that board members are expected to actively participate in making decisions, resolving issues, and participate in planning. Duty of obedience: Compliance with all local, state, and federal regulations and laws applicable to the nonprofit is an essential responsibility for board members. Additionally, these three major legal duties ensure the organization is committed and stays true to its stated mission. Board members must act as fiduciaries by closely overseeing the nonprofit’s finances. Board members are tasked with reviewing financial reports (i.e. donations received and expenses), evaluating policies (such as a cash handling policy or a gift acceptance policy), and approving budgets. They must also take into account the resource needs of the organization, in addition to accountability to donors, parties served, and the general public. Whether you’re donating your time and serving on a nonprofit board, or running a nonprofit and are training the board (sometimes called “managing up,” and not an easy thing to do), it’s important the aforementioned duties are fully explained and understood by all parties. Let me suggest two good and very practical ideas. First, consider providing a board orientation, once a year, where the entire meeting is devoted to an outsider explaining and discussing with the board the full extent of its legal and fiscal duties. Second, consider drafting and distributing a “job description,” not only for your employees, but also for your board members. Put in writing what you expect of the board, including the legal protection they must offer. Working with nonprofit leaders is one of my passions and a critical part of my main mission to promote and maximize charitable giving in Iowa. If you’re on the board of, or work for a nonprofit that is facing challenges, or if you simply want to be prepared to avoid challenges, don’t hesitate to reach out. I can be contacted at anytime by phone (515-371-6077) or email to schedule a free consultation.